Jelsma Graphics was formed in 1985 by Denny G. Jelsma, who has spent many years as a top marketing executive for a worldwide corporation. He has brought those skills to Jelsma Graphics, making the company one of America's leading distributors of fine railroad art. Denny, himself a lover of railroads and well-known in the industries, insists on quality in each one of Jelsma Graphics' prints. Jelsma Graphics' owns many of the original art works, as well as many of the rights of those prints. Many of the prints sell out within a few months and go on to be rare collectors' items, selling for far more than the original selling price. Jelsma Graphics uses the talents of some of America's best and well-known artists. We hope you enjoy the beautiful prints that are available from Jelsma Graphics. We welcome comments and questions regarding our web site and product offerings by phone, e-mail, and through our web site. * Click here to submit feedback * that can be used to quickly and easily send us your feedback. Denny G. Jelsma is the fifth child born to Irvin and Helen Jelsma in November of 1945. He was raised in a small Dutch community in Pella, Iowa. The Jelsma family is from Friesland, Holland. The "J" in Jelsma is pronounced like a "Y". Denny graduated from Pella Community High school in 1963. He attended AIB business school and the MBA program at Harvard Business School in Cambridge, Massachusetts. Jelsma started his work career selling business forms in western Iowa, northwestern Missouri, and eastern Nebraska. In 1968, Jelsma entered the water conditioning business as a salesman working his way through the ranks to sales manager. In 1971, Jelsma moved to Jacksonville, Florida and was promoted to general manager of the Jacksonville store. In 1976, he was promoted to southeastern USA sales trainer, then district manger, area manager, eastern regional manager-field vice president, and became Culligan Internationals most honored executive. 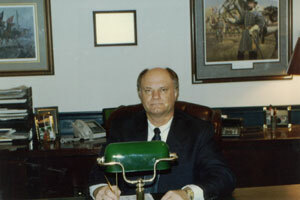 In 1985 Jelsma purchased several Culligan franchises in south Georgia and Florida. In his long career in the water conditioning business, he has achieved hundreds of awards and honors; such as Number One Salesman in the World in 1969, 1973, and 1974. He was a member of the Presidents Sales Club in 1969 through 1975. He was Manager of the Month fifteen times, and was named Outstanding District Sales Trainer in 1978 and Outstanding Area Manager in 1979 for Culligan International, and received the Budget Achievement Award 1976-1984. Jelsma was in Culligan Internationals Honor Circle of top executives seven times. Jelsma received the Culligan Circle of Excellence award for their top ten dealers world wide out of 1356 dealers three times. Jelsma was elected four times to Culligans prestigious dealer advisory council. Jelsma was one of seven founding fathers of the Culligan National Dealers Association. Jelsmas Culligan dealerships were in the top fifteen ranking every year. Jelsma was also named to Whos Who of International Businessmen four times. Jelsma retired from Culligan water in 1995, but still does some consulting for Culligan dealers around the world. Jelsma started Jelsma Graphics/Dennys Brass as a part-time business in 1985. Since 1995, Jelsma has devoted most of his time to Jelsma Graphics, he says, like seven days a week, 18 hours a day, making Jelsma Graphics the leading distributor of quality railroad art and embroidered clothing. Jelsma states "my goal in life was to be able to retire before I was 50. I did at 49 and wanted to play with my trains. But Jelsma Graphics has taken over my time. I wanted to follow in the foot steps of my great-grandfather, Sietse Jelsma, and my grandfather, Jella Jelsma, as successful entrepreneurs. Im very proud of my upbringing in Pella and my Flieslander Dutch heritage. The Dutch are the leading investors in America and are very well known for their Dutch products, and Pella is famous for its windows and Vermeer manufacturing, plus its Dutch pastries. I try to be a goodwill ambassador for the Dutch and for Pella. Life has been very good to me. I feel Ive lived seven life times, traveling all over the world and meeting some very important and interesting people. I have truly been blessed, and all this to have happened to an unknown Dutch boy from little Pella is sometimes overwhelming. I feel very lucky." Jelsma states, "Im very happy and at peace with myself and Almighty God, and with great accomplishment. My children are well educated on their own and well on their way to their own success. I plan on keeping busy running other businesses that I own and visiting Pella, my hometown, more often. When the Lord God calls me home, Ill be brought back to Pella to rest in peace in this beautiful town. Jelsma lives in Jacksonville, Florida. About Denny G. Jelsma was reprinted from a article from the Pella Chronicle newspaper ZAKEN/Business section March 17, 1995.